The Darkwave Limited Edition Fennux Coat is here! NOTE: THE LE FLAME SPIRIT EYES (SEEN HERE) ARE VERY RARE, DO NOT EXPECT TO GET THEM, BUT IF YOU DO GET THEM – CONGRATULATIONS! And that’s all there is to it! Enjoy your Darkwave LE Fennux Den, and your 12 Days of Reserve Food! WHERE DO I GET MY DARKWAVE LE FENNUX? The Wishing Well exists only on the Fennux Sim. We have 1 setup next to every Crafting Machine, and of course these Wishing Wells are used to turn any 12 Fennux Dens into 1 Darkwave LE Den (and 12 days of Reserve Food). Yes there is a SMALL CHANCE to get “LE Flame Spirit Eyes”, but the odds are roughly about a 0.5% chance to obtain, so don’t expect to get them! The LE Flame Spirit Eyes can pass onto other coats, so even if you don’t get them from Wishing, you will have opportunities to obtain them in the Secondary Market later. Most Fennux however will have regular eyes from a starter den, very similar to Crafting – the only thing that is “LE” on most Darkwave LE Fennux is the over-ride of the Fennux Coat. It’s more-or-less exactly like Crafting, except for the fact the coat will not pass. IF YOU ARE PLANNING ON MAKING A GLASSES ATTACHMENT, YOU MUST COVER THE FENNUX EYES WITH THE ATTACHMENT. THE GLASSES ATTACHMENT SWAPS WITH THE EYE SCULPT, WHICH CAUSES THE EYES OF THE FENNUX TO DISAPPEAR ENTIRELY PUTTING IN PLACE THE GLASSES ATTACHMENT. WE RECOMMEND DEVELOPING SUNGLASSES, VISORS, BLINDFOLDS, ETC – ANYTHING THAT COVERS THE FENNUX EYES FULLY. HATS REPLACE THE HAIR SCULPT (EVEN IF YOUR FENNUX DOESN’T HAVE HAIR, IT REBUILDS IT WITH A HAIR SCULPT TO REPLACE), SO THERE IS A BIT MORE CREATIVE FREEDOM WHEN DEVELOPING HATS! IF YOU ARE GOING TO DEVELOP WITH THE HAT ATTACHMENT, AND YOU ARE NOT GOING TO COVER THE TOP OF THE HEAD, YOUR CUSTOMERS MAY BE UNHAPPY TO USE YOUR PRODUCT ON A FENNUX WITH A SHORT HAWK, TWIST HAWK, ETC – SO TRY TO INFORM THEM IN YOUR PRODUCT MARKETING THAT YOUR ITEM MAKES USE OF THE HAT ATTACHMENT, AND ADVISE THEM NOT TO USE IT ON FENNUX WITH HAIR TRAITS. We are announcing a new, completely free product for 3D Content Creators! If you are good at creating sculpts from scratch in third-party programs, we welcome you to try out the new Fennux Glasses and Hats Developers Program. To get started developing you will need to obtain our item “Fennux – Hats and Glasses Dev Kit”, which is available at the Official Fennux Sim (near the landing point). 1.) Rez the object “Fennux – Hats and Glasses Dev Kit” onto the ground. 2.) Click on the object “Fennux – Hats and Glasses Dev Kit”. a) Edit the size with “Stretch both sides” enabled. b) Swap the sculpt map. c) Swap the texture map. YOU CANNOT EDIT ANYTHING ELSE. You literally are only allowed to edit the scale when “stretch both sides” is enabled, and edit the sculpt and texture maps, nothing else is allowed to be edited – else the items will not function properly and will be declined when submitted to us for approval. This includes but is not limited to the Texture Repeats per Face, Texture Offsets, Texture Rotation, etc. – you can’t touch any of these values, they have to remain the default. 5.) After you are done creating the sculpts, editing the scaling, etc – you may click on the object and press “Realign Glass” or “Realign Hat” to make sure everything is setup properly, if it looks wrong after you have pressed either Realign button – you probably need to keep editing your sculpt(s) in your sculpting program until they appear perfectly on the Fennux example model. 6.) Once you are positive the Hat and/or Glasses look fine on the default Fennux Model, you may press “Export Hat” or “Export Glass” to get a string of text. 7.) Copy the string of text to your clipboard (Ctrl + C while it’s highlighted), and then paste this into a ticket on the Fennux Support Helpdesk (Ctrl + V to paste) under the category “Developers” sub-category “Accessory Submissions”. And that’s all there is to it! Expect to hear back from us within a few days. We review each and every submission so it can take a while to process them. Not all submissions will be approved, we are looking for quality as well as making sure no one attempts to use stolen content in their submissions. Please also understand that each item has to be 1 single sculpt per attachment point (Glasses / Hat). 1 sculpt, 1 texture, that’s it. Please understand that this program is designed for 3D Content Creators who know how to export sculpts professionally – you cannot simply purchase some sculpts on the SL Marketplace and expect them to fit on our Fennux model. You WILL have to use a professional sculpting program to export the sculpts in just the right position, rotation, etc. so that they automatically work with our existing animations. It will be a “trial and error” sort of situation – but we’ve tested it with a few sculptors and they were able to figure out how to export the sculpts to work with our Fennux, so we hope that you will be able to as well. If you have any issues you may contact us via the Fennux Ticket System and we will be glad to assist you. If your submission is accepted, we will update your Support Ticket with a unique code. You will need to go in-world on Second Life and click on the “Fennux – Hats and Glasses Dev Kit” again, and click on the menu item “Get Script”. It will deliver to you a notecard which has a script inside. You will need to copy the contents of this Notecard to a new Script file. You will see at the top of the file something that says… string uuid = “code-goes-here”; …simply change that code-goes-here portion to say your Unique Code. You will also see at the top of the file something that says… string object = “Hat”; …simply keep this as Hat or change it to Glass depending on what type of item you are creating. After you have edited and saved the script file – make sure to change the permissions to “No-Modify” (VERY IMPORTANT), and in most situations you will probably want to make sure the script is “No-Copy”, else someone could use your script to make unlimited free hats or glasses. Again, this is VERY IMPORTANT that you make sure to set “No-Modify” and most likely “No-Copy”, transfer is fine to keep on. Drop that script (after you are 100% positive the permissions are finalized) into an object you want to use as the actual item you sell to people. This item will be touched by the purchaser to start the process of applying it once onto their Fennux. We recommend that you use the same sculpt you made as the item you sell to people. After you have the script inside the sellable object, make sure the permissions are setup properly – and you can now sell your items to anyone on SL. You can even put them up on SL Marketplace, pass them out for free, it’s your content – you make 100% of the profits. Saying this once more, make sure the script is No-Modify, otherwise someone can get your Unique Code and make unlimied versions of your hat or glasses without your permission – and there’s nothing we can do about that. If you decide to make an item copy, keep in mind that someone can have people transfer Fennux to their account, and they can make unlimited Hats or Glasses for the Fennux transferred to their account. We do not recommend keeping Copy permission on your finished product, of course you can do whatever you want as it is your product. That’s about it – I know this is a long post, but it should be very helpful to content creators making third-party accessories for The Fennux Breedable Pets. LEGAL – Team Fennux LLC always remains to have the right to disable products, including approved ones, as we see fit. If you are found to be breaking our Terms of Service we reserve the right to remove you from the Fennux Developers Program. Developing products for The Fennux is a privilege not a right. We have 3 new items in our FNX Point Vendors! The “Elite” coat Fennux will NOT pass its coat onto its offspring, but it will have a chance at passing the NEW LE “Scarlet Eyes” that it comes with. It is possible for the “Elite” coat to have traits, and of course those will have a chance at passing as well. It is also guaranteed to be a T3 Region. These new items are available on the Fennux Sim. Keep in mind we now have the option to Transfer FNX Points. You are allowed to offer to trade FNX Points in our Fennux Trading Group, but we ask that no one post any prices similar to our traditional ruling on advertising Fennux for sale. A brand new feature from Team Fennux – FNX Point Transfers! On the “My Account” page you can click “Settings” to get to the FNX Point Transfers area. This will allow you to transfer points you own from your account to another member’s. You will have to enter your password each time you try to transfer points. The Jungle Limited Edition Fennux Coat is here! And that’s all there is to it! Enjoy your Jungle LE Fennux Den, and your 12 Days of Reserve Food! WHERE DO I GET MY JUNGLE LE FENNUX? The Wishing Well exists only on the Fennux Sim. We have 1 setup next to every Crafting Machine, and of course these Wishing Wells are used to turn any 12 Fennux Dens into 1 Jungle LE Den (and 12 days of Reserve Food). Most Fennux however will have regular eyes from a starter den, very similar to Crafting – the only thing that is “LE” on most Jungle LE Fennux is the over-ride of the Fennux Coat. It’s more-or-less exactly like Crafting, except for the fact the coat will not pass. If you are not yet involved in our Affiliate Program for one reason or another, you may want to reconsider after reading this post. Team Fennux is now offering Linden Dollars (L$) instead of FNX Points to our affiliates. This change is effective immediately and I recommend you read below to find out the exact details. NOTE: IF YOU ALREADY HAVE THE “FENNUX AFFILIATE KIOSKS 2.0″, YOU DO NOT NEED TO UPGRADE YOUR AFFILIATE ITEMS. EVERYTHING 2.0 WORKS WITH OUR AFFILIATE PROGRAM. THIS WAS ONLY A SERVER-SIDE CHANGE. If you are the first person to “refer” a Second Life member to click on a Fennux Affiliate Item, then you will be considered the “Referrer” of that member. If that member clicks someone else’s Fennux Affiliate Item after they have already clicked on your own, you will still be considered the “Referrer” of that member. If that member has already used a Fennux HUD prior to clicking – our server considers them already being a Fennux Member, meaning their “Fennux Join Date” will be earlier than when they were “Referred”, but you will still be considered the “Referrer” of that member. After you are marked as the “Referrer” of a Fennux user, you will start earning 25% in Linden Dollars (L$) for every Starter Pack purchase that user makes within 45 days of that user’s initial “Fennux join date”. You will also earn 15% in Linden Dollars (L$) for every other purchase that user makes within 45 days of that user’s initial “Fennux Join Date”. (Not 45 days after they clicked your affiliate item, 45 days after our server considers them joining – which includes them using the Fennux HUD.) After the 45 days are up, you will no longer continue to be compensated based upon their purchases. As a bonus, Team Fennux is giving away 100% more Fennux Kibbles in the form of Reserve Food FREE to any Referred Starter Pack Purchase FOREVER. This means when someone you refer buys a Starter Pack, they will automatically receive the same amount of food that is inside the starter pack in the form of Reserve Food. That’s 100% more food FREE, just for being referred by someone like you. Anyone who has ever been referred by another user to join Fennux is eligible to get this bonus. It pays to get referred! When referring people, make sure to let those potential Fennux breeders know that if they click your affiliate items they can get 100% more kibbles (in the form of Reserve Food) FREE for life. Keep in mind that this is only for Starter Packs, and not for regular food purchases. Since we are now offering Linden Dollars (L$), we are no longer offering FNX Points in exchange for referrals. If you have any feedback regarding this change please let us know via the Support Ticket System. To sum this post up, if you want to earn Lindens – grab yourself a Fennux Affiliate Kiosk box at the Fennux Sim for free, and start referring as many people as you can. You’ll start earning 15-25% of every purchase that they make for the next 45 days (so long as their clicking is the same as their joining), and they will get a bonus of 100% more kibbles (in the form of Reserve Food) each time they buy a Starter Pack. If the starter pack normally came with 28 kibbles, they would get 28 Reserve Food kibbles as well (totaling 56 kibbles). Team Fennux reserves the right to amend or withdraw this program anytime. Team Fennux has been very quiet over the past couple of months. We’ve continued to release new Wishing Well LEs every month, we brought out the Capture Dueling Arenas and continue to update them, but other than that there has not been any other vital signs that we’re even alive. Well we are alive, and doing quite well! So well in fact that we’re now ready to share with the public what we’ve been up to behind the scenes this whole time. We have not updated The Fennux in all of the 7 months that they have existed. We are nearing the time where we will be doing our first update. When we say update, we don’t mean a brand new game where we’ve changed everything – we simply mean a shinier version. So let me start off by detailing a few of the new features we’re adding to The Fennux. We have added slight movements of the Fennux Eyes, they will look to the left and to the right, up and down, and diagonally. Fennux will now breathe slightly when asleep. Fennux will sometimes find a ball to play with, allowing for multiple Fennux to chase after the same one as if they’re playing together. 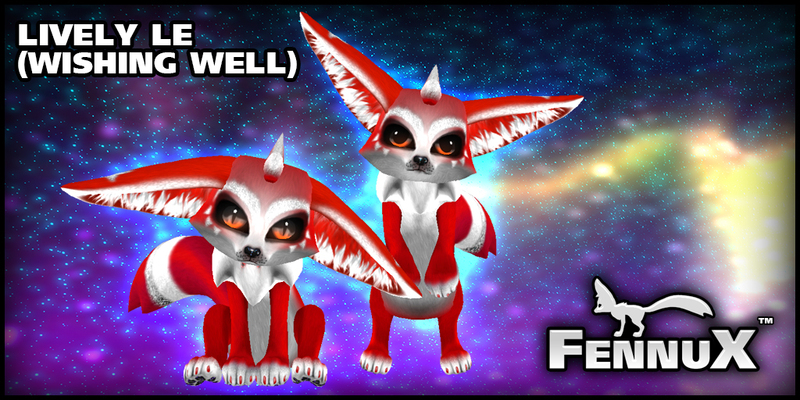 Fennux will sometimes emit particles above their head depending on their mood or depending on what holiday is going on. Fennux will hop over to their dish of kibbles when they are hungry (so long as you have kibbles in range). Fennux are now able to be pet via the HUD, which is simply a fun new animation. Fennux will sometimes curl up next to each other and sleep (on purpose). We also have added a lot of technical features such as storing the Activity Level inside the Fennux itself – you can configure this from your HUD now instead of requiring a Home. We fixed an issue where Fennux attached to Avatar Center (running along-side you) would randomly ball up every so often. We fixed an issue with the Fennux Head Sculpt showing a slight line on the sides of the cheeks, it now is completely smooth (sculpt type was cylinder, it is now torus). We fixed some hydration issues so that you can now hydrate a Fennux immediately after a successful mating (some people had issues, those people will no longer have issues). We added the ability to set your Fennux up on Web Market in a static pose, so your Fennux can sit, stand, etc. We added a method for creating unlimited mini-games / interactive items / etc, allowing Team Fennux to be able to release new content without requiring further updates (after this one). We also added a detection for whenever no one is around to actually see your Fennux, it will put them all in activity 0 to keep lag down. We are adding Path-finding options, and a few new animations to the mix. Oh and Fennux will have the ability to turn on or off Full Bright globally, so if you want to see your gorgeous Fennux Textures at their best – you can! We made this option able to be turned on/off for a reason, as not everyone wants full bright on their Fennux – but for those of you who do – enjoy! We are adding a few updates to the Fennux HUD, such as the addition of a Tree Button on the INFO Tab, a TP to Fennux Main Store button and a Refresh Reserve Food button on the ME Tab. We changed the Eternal Merge button to have a red border (it also has Deletes Fennux sub-text) so people better know the difference between Merge and Pet, and lastly we added a way for creators of Fennux Packs (groups) to leave with the option of setting someone else as the head of the Pack. A few new items will be showing up (some free, some for purchase, more details soon) including the Eternal Merge / Eternal Pet Reversal, this will reverse any merge or any pet that you or someone else has done, as well as a new Build-able Fennux Home – where your Fennux will actually seek out pieces of the home, retrieving them and building a useable home over time. We just made a way to eternal merge all recipes at once – including a controller to merge all on the same region at once. There are also a few more surprises coming your way. We are listening to a lot of feedback (if you have any, submit a ticket, we LOVE Feedback!) and have a few more ideas for the secondary market, as well as ideas to create a new market of sorts – but more on that later. Please keep checking back here for more information regarding the planned update. If you need to ask a question directly, please submit a ticket to us. Thanks for reading and keep on breeding! OH YES – we forgot to mention that the update will be hassle-free! We have a new method of updating Fennux in mass quantity (although the old method of obtaining a new HUD and rebuilding each Fennux one by one still works), but the mass quantity option may be better for breeders who own many Fennux. The Patriot Limited Edition Fennux Coat is here! And that’s all there is to it! Enjoy your Patriot LE Fennux Den, and your 12 Days of Reserve Food! WHERE DO I GET MY PATRIOT LE FENNUX? The Wishing Well exists only on the Fennux Sim. We have 1 setup next to every Crafting Machine, and of course these Wishing Wells are used to turn any 12 Fennux Dens into 1 Patriot LE Dens (and 12 days of Reserve Food). Most Fennux however will have regular eyes from a starter den, very similar to Crafting – the only thing that is “LE” on most Patriot LE Fennux is the over-ride of the Fennux Coat. It’s more-or-less exactly like Crafting, except for the fact the coat will not pass. The Lively Limited Edition Fennux Coat is here! NOTE: THE LE FLAME SPIRIT EYES SEEN ABOVE ARE VERY RARE, DO NOT EXPECT TO GET THEM, BUT IF YOU DO GET THEM – CONGRATULATIONS! And that’s all there is to it! Enjoy your Lively LE Fennux Den, and your 12 Days of Reserve Food! WHERE DO I GET MY LIVELY LE FENNUX? The Wishing Well exists only on the Fennux Sim. We have 1 setup next to every Crafting Machine, and of course these Wishing Wells are used to turn any 12 Fennux Dens into 1 Lively LE Dens (and 12 days of Reserve Food). Most Fennux however will have regular eyes from a starter den, very similar to Crafting – the only thing that is “LE” on most Lively LE Fennux is the over-ride of the Fennux Coat. It’s more-or-less exactly like Crafting, except for the fact the coat will not pass.